← Swole Phase 3, Week 2 of Glory. Swole Phase 3, Week 3 of Glory. Luke Thighwalker and his sidekick Pump Solo have embarked on a mission to destroy the evil Emperor Palpatine who has imposed a new Galaxy wide ban on Spacelifting. 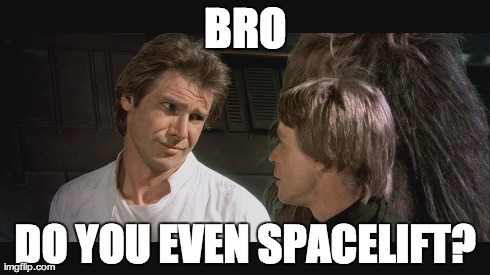 Brobi Wan Kenobi has issued a call to all Spacelifting bros to join their fight. Will you let the evil Sedentary forces of the universe prevail or will you join the Swole side and use your muscle FORCE for good?? Emphasis on strength days should be on pushing heavy weight with ample rest. Please use proper form, bros (see Youtube for a wealth of video resources on this subject). Perform these rounds as one unbroken movement complex. Choose a LIGHT weight that will allow you to do this (i.e. 95-135#); focus is on proper form and going at moderate to fast pace. Plyometric Push-ups, 8 sets of 3 EMOM (Every Minute on the Minute), lower yourself slowly and explode as much as possible once your chest touches the ground. Go unbroken for these reps during each round; rest 30-60 seconds between rounds. Tailing off last week’s vid, here’s another beautiful interpretation of a song from the epic Disney film, Brozen.